The Snake river flows into the Columbia, the largest North American river entering the Pacific Ocean. At 1,078 miles, it works hard for the West. Used to generate hydropower since 1900, more than 500,000 customers rely on the Snake for electricity. Land along the river also supports vibrant agricultural communities. Barges on the river transport commodities to deep-water ports throughout the region. Yet the natural function of this river is impaired. Flow and water velocities have decreased, streamside vegetation has been removed, and heat, sediment, and nutrient loads have increased over time. A consequence? The waters that historically supported an abundant population of native fish are compromised. Beginning in 2014, The Freshwater Trust (TFT), River Design Group and other partners began collaborating with Idaho Power Company (IPC) to fix this. We completed a comprehensive evaluation of the watershed and built a process-based restoration plan for increasing river function for a more than 30-mile reach upstream of the Hells Canyon Complex. The Snake River Stewardship Program encompasses three initiatives — narrowing and deepening key sections of the river channel, irrigation improvements to reduce the amount of nutrients and sediment entering the river, and planting native vegetation on the banks of tributaries to protect water temperatures. To be able to relicense its dams, IPC will likely need to create more than 12 billion kilocalories per day through the restoration program. If the program moves forward over the next 40 years, TFT will quantify and track exactly how strategic restoration will more than offset the impacts of the dam. 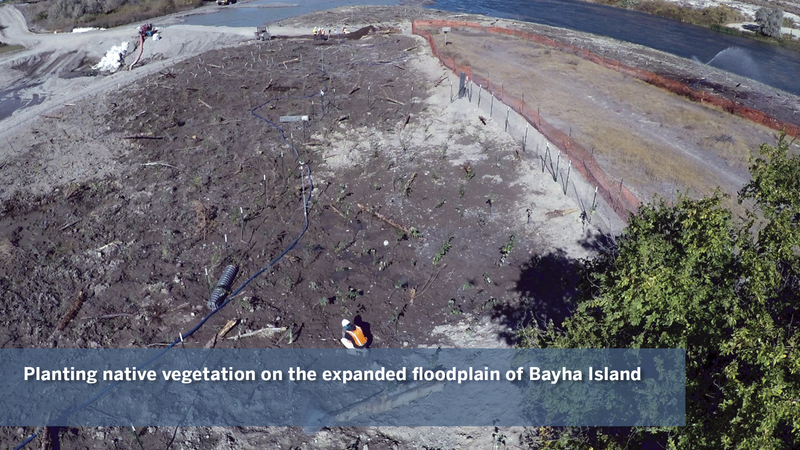 In 2016, IPC broke ground on projects at Bayha and Wright Islands. Upstream in the Grand View area, projects in 2015 and 2016 converted 648 acres from furrow to sprinkler irrigation, preventing 1,000 pounds of sediment from washing off fields. “We’re attacking the factors that currently hinder the quality of this river from all sides,” said Christy Meyer, Idaho conservation manager. The Snake River Stewardship Program kicked off in 2016 with work on Bayha and Wright Islands. Material was excavated from the river bottom and used to create floodplains adjacent to the islands. Excavation changed the channel depth from approximately two feet to between six and eight feet. Gravel and topsoil were also brought into the new floodplains, and brush and small logs were added to create roughness. The floodplains were finished with sod mats and native vegetation, including willow, cottonwood, dogwood, currant and Wood’s rose. In total, we built eight acres and planted 14,000 trees. High water inundated the floodplains within two months of planting, but it produced minimal damage. Dozens of temperature loggers installed around the islands are tracking the change in water temperature as the area transforms from a slow-moving, shallow system to a fast-moving, narrower and deeper system. How does expanding a floodplain and deepening a channel fix a river? Benefits include cooler, deeper water for fish; better filtration of sediment and nutrients; more areas of clean gravel for native fish reproduction; fewer unwanted aquatic plants; and enhanced wildlife habitat. 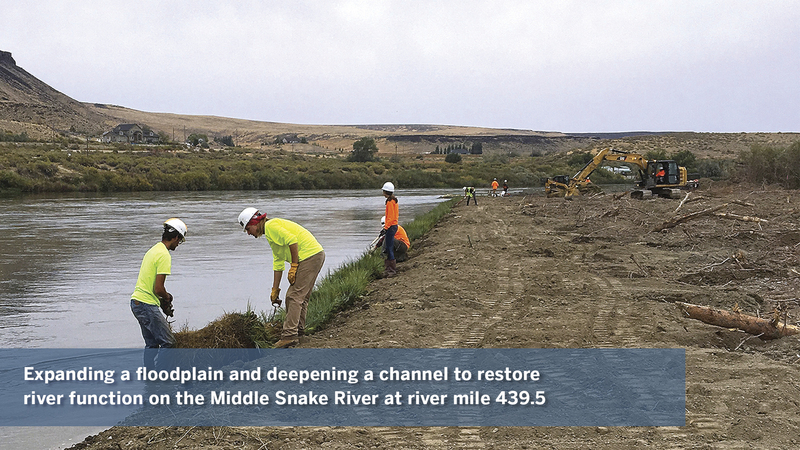 Information gained from this pioneering research project will inform the strategy for implementing additional instream projects throughout the Middle Snake River.